The Ford Scorpio appears to be better protected against the ravages of European winters and salted roads than most. Having looked at maybe 20 examples of the marque I have yet to find a seriously rusted one and most damage seems limited to either bad accident repairs or carpark scrapes. Whilst rustproofing my vehicle I came across evidence of high quality materials having been used and very few mud traps that would encourage rust to start. However the oldest Scorpio is now 9 years old and preventative measures should be taken to ensure that they stay rustfree - remember that a vehicles value is primarily judged on it's bodywork - when they start to rot then it's a downhill slope as rust can never truly be removed from steel - only slowed down. First of all I'll show you the materials that I use - I have been using them on vehicles since 1979 with a great deal of success and so I am happy enough to recommend them although you may have your favorites of course. I imagine everyone is familiar with this as it's widely available at Motor factors and Halfords. It's not cheap but it is very good stuff for stopping rust forming and also for use over rusted areas. The secret to applying it is to firstly remove mud and any flakey rust from the area in question and then apply a light spray coat and leave it for a few hours to go off. In the can it's a thick light brown liquid that needs to be kept warm so that it will spray easily using the pump up pressure can. I normally stand my can in a bucket of very hot water when using it and store it in the house the day before to keep it warm. Also always keep the pressure high in the can otherwise it doesn't spray well. Waxoyl is a rust preventative wax in a suspension of something similar to white spirit and is designed for cavities and areas which will then be impacted by stones or dirt. However I use it everywhere and just redo it every 6 months on areas that are in direct line of attack from spray and stones. This is a very thick black 'paint' that can be applied to high impact areas such as the underneath of the car. It dries to a resilient but flexible finish that allows stones etc to bounce off. I use Waxoyls version as it has the Waxoyl rust preventatives added and is very smooth to apply and add. Also any over paint or the stuff that ends up all over your hands can be removed with a little waxoyl on a rag which dissolves it. I treated the underneath of the car with undershield which I let dry for 2 weeks and then applied a dose of normal Waxoyl over the top. 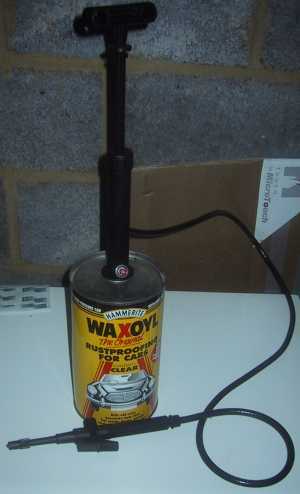 You can purchase Waxoyl in a spray can but I have never found it to be very good. When I want to spray visible panels (such as the inner wings of the engine bay) I use the Comma Wax Seal. This is an almost clear brown spray that is very thin and is applied to areas that will eventually be seen. Waxoyl is too thick and too coloured to be used and looks unsightly on visible surfaces whereas the Comma is almost invisible. I also find that in small internal sections such as the bonnet and bootlid that the Comma disperses easier and provides better coverage whereas Waxoyl is better suited to major box sections and inside the doors etc. Everyone has their favorite car polish and I purchased my first MER about 10 years ago and still use it today. Keeping the car clean is the number one priority and helps ensure that the bodywork stays looking good and also makes you aware of any damage that needs fixing. MER is now generally available and I apply it every 6 months in the summer and every 3 during the winter. I wash the car about every week depending upon how many miles I have done and the weather - firstly using a Triple Wax car wash (never washing up liquid which contains salt!) to remove the dirt and I then use a bucket of hot water with two capfuls of MER added - it doesn't foam like the car wash but I rinse over the car with this which let's it dry to a fairly decent shine. I can only recommend one thing for this - go to your Ford Main Dealer and buy the stonechip repair kit - it's far cheaper than you expect (I paid about 6 pounds) and is a perfect color match. It comes with a small tool in the lid for removing any rust from the scratch and then a base coat which you apply and let dry followed by a clear laquer that seals the repair. I have tried third party products and none were a patch on Fords own and no cheaper either. Take a look at the Picture Guide page to see my recommended rustproofing areas and Where to find rust for some photos of rusty Scorpios. Let me know if you have any more or if you find corrosion anywhere else.